I’ve been making so many cocktails using the fresh fruits of summer I’ve sort of forgotten my ‘Classic Cocktail’ series that everyone loves which usually includes a history of the drink. I promise to do another of those soon but in the meantime, when fresh fruit is at it’s peak, I just love finding a way to use it for the cocktails I make. Considering the heat of the summer we’ve all been dealing with across the country; I thought everyone would love something a bit lighter and certainly a lot colder. How cold? Well, you can’t get much colder than a popsicle, right? There was no great plan in the works to make these. As a matter of fact I was just tired of the heat. I’m going to do several cold, slushy or frozen treats this month whether for ice cream or in a fun cocktail fashion. I had just ordered some new popsicle molds and in a weird way the anticipation of those being delivered made it impossible for me to wait! So, after the dust settled for the fourth of July this past Wednesday evening I took stock of some juices in the fridge and some fruits in the freezer and came up with a plan for a slightly boozy popsicle. Hold on…where’s the beef…or in this case, the popsicle? I thought I was being conservative but in truth it’s evident I pushed the envelope (or tequila) just a bit too far. Too much alcohol and things won’t freeze. That’s good for Limoncello so you can keep it ice cold in the freezer but in the case of these popsicles it meant disaster. The sticks slid out of the frozen part and I don’t doubt the heat didn’t help. Some might cry (and take their miserable popsicles with them) but maybe high altitude baking has taught me a thing or two about perseverance. Don’t pitch it. Fix it. Scooped out of the container, sticks removed and piled in a glass rimmed with salt and sugar…oh yeah they’re good! They’re sweet so a fun dessert cocktail but they’re also fresh, they’re pretty and trust me, they go down VERY easy. 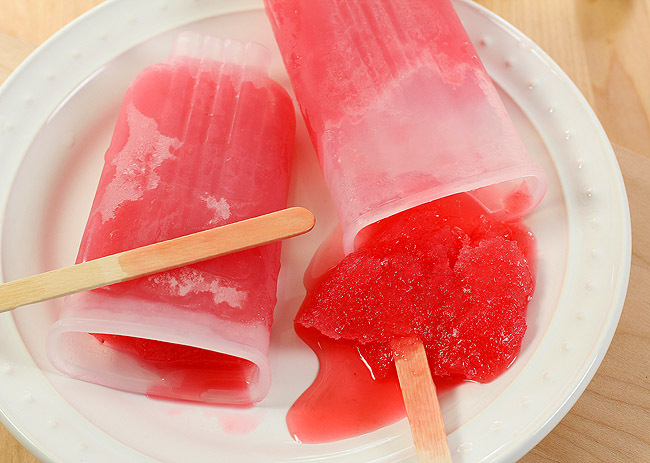 As for those popsicles, I’ve ordered a book filled with recipes for Mexican Paletas. Paletas are Mexican Popsicles which are either cream or water-based treats and I love the unique flavor combinations; visit some parts of Denver and you can find them being sold from carts on neighborhood streets. We don’t have that in the burbs and I wanted to make my own; who knows maybe I’ll start my own paleta business (kidding) so look for one of those very soon. Want to read the last part of the post I wrote before I took them out of the freezer? “Don’t be tempted to up the booze ante though; too much and they would never freeze. 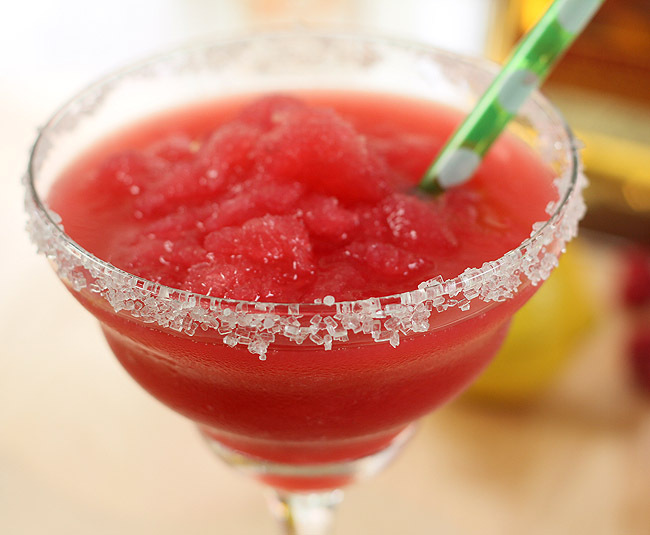 Granted a Raspberry Margarita Slushie would be fine but these are light and sometimes that’s all we need.” A classic case of how I should have taken my own advice! Still, no worries; my next door neighbors have been called and I’m sure they will not refuse this frosty treat in a glass…neither should you! Can’t you almost taste how sweet, tart and cold it is? Both pretty and cold; these are a great summer refresher. Add lime juice, lemon and orange juices and stir; cool to room temperature. Put raspberries into blender or food processor and blend until smooth. Taste and add sugar if necessary if using fresh berries. Add juice mixture, tequila and orange liqueur and process just to blend. Strain through mesh strainer to remove any raspberry solids. Rim a glass with a salt and sugar combination and scoop the slush into the glass. Add a straw and have fun! Join me every Friday for Friday Cocktail Hour when I’ll make a cocktail I love, recreate one from a local establishment or maybe just have some fun experimenting! They were fun but I’m sort of obsessed with getting the popsicle thing right. There WILL be a boozy popsicle or two this summer. Just not quite so boozy as this slush! Thank you so much; hope you enjoy some of the recipes as much as I do. Thanks for sharing the photos of the slushy popsicle– I am glad it’s not only my kitchen where things don’t always turn out as planned! 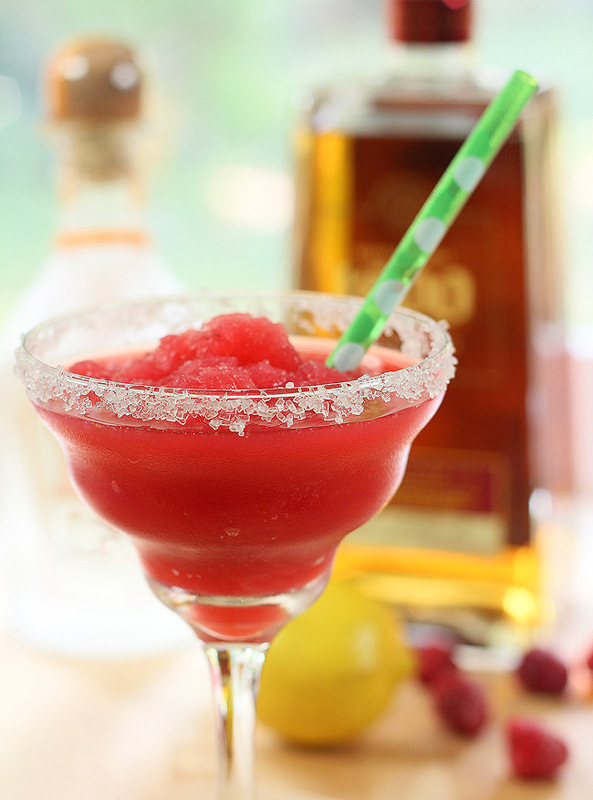 That being said, I think I like the look of your margarita slushy even better than a popsicle– what a happy ending! I let my readers know when I have issues; it’s only fair right? My worst and funniest was my first effort to make angel food cake. I mean so bad I pitched it and made brownies instead! I’m going to try that cake again but if there was ever anything that required altitude changes; that baby is it. Id call this a happy accodent. You know I have a weakness for margaritas! I’ll take a pitcher please! That is the perfect description. I’ve learned my lesson and next time I’ll cut back on the tequila…just not too much! Now that’s a happy accident if I ever saw one! Aw, who needs a popsicle anyway? Slushies are much better especially when they have a high tequila content. I love paletas. My favorite is creamy coconut. Mmmm, I’m hungry just thinking about them. That is sure the tradeoff…can’t put enough booze in them to matter…so slushy it is. But…I am thinking of a pina colada paleta. Yep! Ha! I saw you posted a pic of these the other day and I thought to myself that you should eat them out of a bowl. I suppose great minds think alike. Sometimes mistakes ended up being spectacular! Have a great weekend. Not the first time we’ve been on the same page is it? Yes, great minds at work. I sure wasn’t going to pitch them and I had some willing helpers too…it was perfect. You too Kelley…thanks for stopping by. This looks great at the moment as I melt in the heat. You are a real mixologist! Too much booze? Nevah! And I so much prefer a good slushy than a popsicle any day. These look and sound fabulous, delicious and refreshing. Since making my first boozy granita, I can’t think of any way I would rather spend the summer! Holy cow this looks fantastic! I don’t think it could look better in a popsicle. I’m drooling over here and it’s not hot!